Cannabis business owners and entrepreneurs have a long Christmas wish list. While the industry made significant progress in 2014, there were some hiccups along the way (ahem, Florida). And most markets are far from perfect when it comes to the business climate, meaning they could benefit from some improvements on the regulatory front. It’s too late for any substantial changes in 2014. But in the spirit of the holidays, here’s a sampling of state-level regulatory and legislative issues topping the cannabis industry’s wish list this holiday season for the year ahead. If Ramsey Hamide has one wish for Washington State’s recreational cannabis industry next year, it’s for lower taxes on marijuana production. Currently, the law assesses a 25% excise tax every time inventory is transferred from growers to processors, then again from processors to retailers, and finally from retailers to customers. That in turn has resulted in sky-high prices for consumers and a huge drain on bottom lines. Hamide, who owns Main Street Marijuana in Vancouver, Washington, said even re-classifying the excise tax to a sales tax could have a “snowball effect” that would allow shops like his to sell cannabis at cheaper prices. That would also help businesses like Hamide’s stay alive even as Oregon’s rec market, which is widely expected to provide cheaper cannabis to recreational consumers because of a lower tax burden, gets rolling in the next couple of years. “Our stores, especially in the Vancouver area, are going to be hit real hard by Oregon unless they enact some of those changes,” Hamide said. While several other states have similar wishes, Massachusetts and Nevada are near the top of the list when it comes to medical marijuana markets where insiders hope to see more dispensary licenses available. Massachusetts has awarded just 15 dispensary licenses – less than half the number currently allowed under the law, and a particularly paltry total for a state with nearly 7 million people. Nevada last month handed out 55 preliminary dispensary licenses, and the state is expected to issue a total of 66. But that won’t be nearly enough to satisfy demand, said state Sen. Richard “Tick” Segerblom, D-Las Vegas. In fact, groups that failed to secure permits have filed lawsuits over the licensing process in both Nevada and Massachusetts. Part of that is because of local demand and part is because the Nevada MMJ system will also cater to medical tourists from other states. Segerblom said he’s working on a proposal that will increase the number of dispensaries by 50%, or another 33 licenses. Although New York and Minnesota joined the MMJ club this year, neither state will allow dispensaries to sell flowers that can be smoked by patients. Businesses will only be able to provide infused products such as pills and tinctures. The emerging medical marijuana industries in both states are hoping local officials alter the regulations to allow smokeable cannabis. “If New York allowed smoking marijuana, more patients would have access to the type of marijuana that they would like, and it would allow that decision to be made between the patient and their doctor,” said Evan Nison, founder of the New York Cannabis Alliance. Doing so would not only give patients more flexibility in figuring out what type of medicine works best for them, but it would also open up the market for growers, producers and dispensaries to put together product lines with a lot more variety. California medical marijuana businesses would like some regulatory clarity from the state – something that’s been on their wish list for a long time. If the state Legislature can get its “regulatory act together,” as an outgoing deputy attorney general said earlier this year, and craft comprehensive rules on the industry, the business climate for cannabis companies would improve drastically. Such a move could also help eliminate the patchwork of confusing – and sometimes puzzling – regulations that individual cities and counties have implemented in the absence of statewide guidance. San Diego, for example, finally paved the way for regulated dispensaries this year after grappling with the issue for a long time. But the law has some odd stipulations. One such rule: The local government requires that all employees be registered MMJ patients – which makes it more difficult to hire workers, adding to the challenges of running a cannabis business. 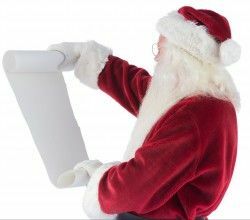 If Floridian MMJ advocates had one Christmas wish, it would be for the Legislature to approve in 2015 a version of the ballot measure that narrowly failed in this year’s election. Amendment 2, which would have legalized medical marijuana, came close to passing but ultimately fell short. Though backers have promised another attempt at passing the measure in 2016, they’ve already begun a push to get the Legislature to approve a similar measure next year. Ben Pollara, the campaign manager of the main group behind the legalization push, said it’s a “wait-and-see” situation with the Legislature. But he expects there will at least be an attempt to legalize MMJ given the huge outpouring of support at the ballot box for the issue in November. That might come in the form of amending Senate Bill 1030, which the Legislature passed last year. The bill currently only allows for high-CBD, low-THC tinctures for severely epileptic patients but could potentially be expanded. MMJ Business Daily is the #1 BEST source for important updates regarding RE-legalized cannabis in America. Thank you so much! If I may comment on the “New York and Minnesota” section: Evan Nison of the NY Cannabis Alliance can demand smoking of the plant’s flowers until he’s blue in the face, but it’s NOT going to happen under the 2014 Compassionate Care Act. The NY health commissioner, Dr. Howard Zucker, is adamantly opposed to NY patients smoking any type of plant material. He does this as a concerned physician who takes seriously his Hippocratic oath to “do no harm.” Secondly, it’s my understanding that vaporizing extracts will be allowed in New York, as well as the production of edibles. The medical market will definitely consist of more than cannabis infused “pills and tinctures.” I think people should stop complaining about the “smoking” part and start working together more to get this industry up and running as quickly as possible for the benefit of all patients in New York.